In NYC’s current affordable housing shortage, every square foot counts. With that in mind, the city announced plans earlier this year to relinquish three parking garages it owns on West 108th Street to make way for 280 units of new housing, all of which would be reserved for people earning less than the average income in the area. Naturally, hysteria ensued. This is the Upper West Side, served by no fewer than three subway lines (more if you count expresses), several bus routes, Citi Bike, and car-sharing services like Zipcar and Car2Go. All those transit options make owning a car an avoidable expense for Upper West Side households, so nearly 80 percent of them choose not to. What about housing security? The developer, West Side Federation for Senior and Supportive Housing (WSFSSH), currently operates a transitional homeless shelter on the block. Their proposal would expand that shelter from 90 to 110 beds and build another 140 affordable units and 45 senior housing units on the garage lots. Another 90 units could be built if the city allows WSFSSH to build 11 stories, a tad higher than the current zoning allows. In response to opponents’ concerns, WSFSSH said in June that it would hold off on developing the easternmost lot — which will ultimately become senior housing — for five years in order to maintain the 125 parking spots there. But that concession failed to win over opponents, who have since circulated a petition opposing the plan and retained a lawyer, Michael Hiller, to fight it in court. Opponents have said the ideal outcome would be to build the housing with the same amount of parking that currently exists. A WSFSSH-commissioned study from Nelson/Nygaard found that the lots contain 675 parking spots combined and are around 90 percent occupied during weekdays. But “having your cake and eating it too” is not possible: The Nelson/Nygaard study estimated that building an underground garage with a capacity of just 118 vehicles would cost $17 million. Simply put, parking is expensive to build, and getting rid of the parking makes it possible to build hundreds of new subsidized housing units. The good news for neighborhood residents is that there will actually be less traffic on local streets without the garages, not more. A 2012 report by Rachel Weinberger demonstrated that people with access to off-street parking at home are more likely to commute by car. Subtract off-street parking spaces in the neighborhood, and fewer people will drive to work. Many people may conclude it no longer makes sense to own a car in one of the most transit-rich places in the nation. For Upper West Siders who truly need a private parking spot, there are 3,500 garage spaces within a 12-block radius, according to the Nelson/Nygaard study. While the study didn’t measure the vacancy rate of those garages, even if they’re 90 percent full, that still leaves room for more than half the vehicles people currently store on sites to be developed by WSFSSH. Parking mania has played a role in the defeat of other affordable housing projects this year. Phipps Houses withdrew its proposal to build 209 units of affordable housing over a parking lot in Sunnyside, Queens, for instance. Even though the development would include 200 parking spaces, opponents said that wasn’t enough, since it would replace a lot with 230 spaces. Local Council Member Jimmy Van Bramer squelched the project, mainly citing concerns about building height and complaints about Phipps Houses’ management practices. 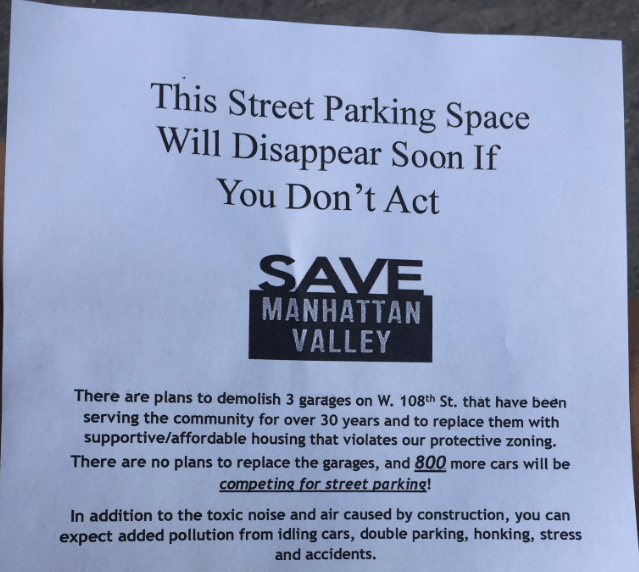 Parking politics will have big implications for the implementation of the de Blasio administration’s housing plan. While changes to the zoning code eliminated parking requirements for subsidized housing in much of NYC, getting that housing built will require many neighborhood zonings needing City Council approval. In practice, that means local council members have the final say. Several council members have acknowledged that parking requirements drive up the cost of housing in New York City, but if they’re not willing to stand up to opponents of parking-free or parking-lite housing projects, their enlightenment won’t be good for much. Correct. But 500/month is way above market rate. 500/month is on pat with a 24 hour guaranteed offstreeto parking garage with attendant below 96th street. Self park is cheaper in the area of $350/month. It is one thing to want market rate pricing, but 500/month is just outright punitive. Because of all the other factors of parking on-street, the market rate is going to be FAR below off street parking. Parking on the street can be likened to camping, while parking in a garage is a hotel. To visit Denali national park, you can pay $400/night for a hotel right on the edge of the park, $250/night a short drive away, or $28 night to camp right in the park in the most choice campsite. But even your 20% is based off of a full service garage, rather than a self park. Legitimate market rate parking on a residential street is well below your ideas. Let’s do some math. The garage on my block is $18.75 per hour. For 24 hours per day and 30 days in the month, that’s 18.75x24x30=$13,500. $500/13,500 = 3.7% of the hourly monthly price. A meter is $3/hr. 3x24x30=$2160. $2160×3.7%=$79.92 per month. So, based on meter to garage ratio, market rate for a 24hr parking permit on an avenue should be $80/month more or less. But, parking on avenues is still more advantageous than on residential streets. They are wider, less likely to be burglarized or vandalized, closer to destination (people parking on avenues tend to be visiting a location on that Avenue within a block or two), and have higher turnover. So, let’s say a 30% discount on the comparative Avenue parking seems fair, especially since your Avenue parker is typically an out of towner who is not contributing to the upkeep of the roads in any way, not a local resident who is making a modest contribution, mostly from income tax and property tax going to the coffers that support road upkeep (not in any way getting into the debate of the property owner/resident who is contributing to road upkeep without ownership of a car). So a price of $56/month seems like a market rate amount for a parking permit. Then, give, say, a 20% discount to the resident who pays annually, up front, for their parking permit rather than monthly to encourage such behavior which saves a great amount of overhead over monthly payment options. But from where are you getting these numbers? And why is it that street parking is worth more than a self park garage? The logic just does not make sense. You and I agree on a lot of things, but I just can’t agree with you here. They simply are not. Very few people would pay that amount. I thought you were in favor of market pricing, but I may be confusing you with someone else. Why would someone pay essentially the same amount (compared to a garage) for a parking spot that is less secure, is exposed to the elements, and requires moving the car periodically for street sweeping? It’s just not worth it. I like the analogy of the campsite vs the hotel. $60-$80 per month is much more realistic, although if such permits ever got implemented I suspect they would be underpriced for political reasons (maybe $20-$40 per month). 20% discount to Off Street Car Storage Is Quite a significant discount. it’s seems a reasonable market clearing price based on private sector pricing. $400/month is very sensible. If car owners aren’t willing to pay this paltry sum for the incredibly valuable space, then perhaps they don’t really need to own a car. Short term Renting might be a better economic choice. They should simply mandate that parking be built into the new housing space. 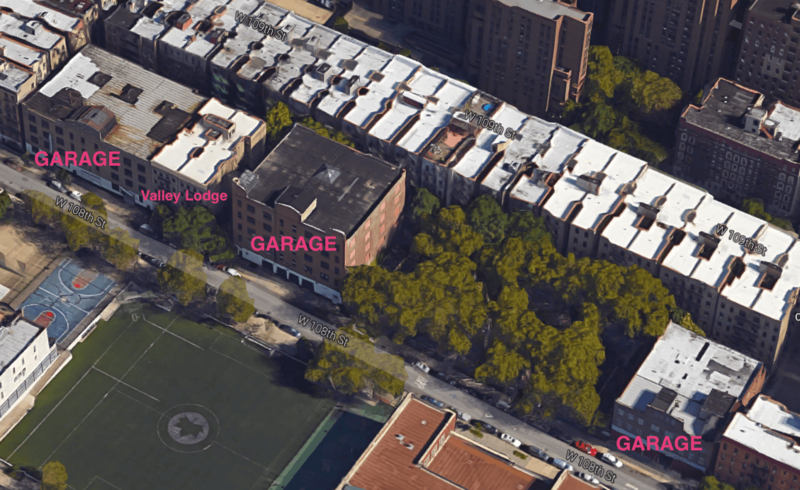 Tonight Manhattan Community Board 7 will take up an application to replace city-owned parking garages with affordable housing on W. 108th Street between Amsterdam and Columbus avenues.